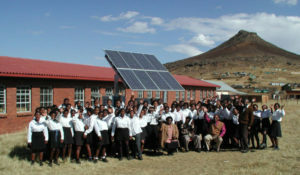 Design and Installation of Solar Power Serving A Community Including House Of Worship. Type: Grid Connected Solar Rooftop + Storage. Location: Kinshasa, D.R.Congo. Energy : 100,000 Wh/day. Payback: 8,2 years. Cost Savings: 17% over system life. GHG avoidance: 629 MT= 132 cars off the road. Avoided CO2 of 70,802 gallons of gasoline. The community site comprised two residential building structures and a religious dwelling in Kinshasa, Democratic Republic of the Congo. The utility company power was not reliable with daily outages lasting 4 hours. The community had been using a backup diesel generator which incurred high operating cost and was loud. 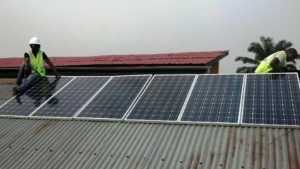 So the community leader hired SMIN Power Group to provide an energy solution that was reliable, cost effective and quiet. First, SMIN Power Group conducted a detailed site visit and interviewed the customer to assess all the needs. Next, SMIN Power Group designed a community energy storage with primary feed from the grid, secondary feed from a rooftop PV, and a backup diesel generator. The community energy storage consisted of a battery bank with (32) 200Ah/12V deep cycle battery cells, a 4.3 kWp rooftop PV, (3) charge-controller with MPPT, (4) 5000W inverters, and the control system. SMIN power Group also increased the energy efficiency by upgrading lighting. Plus, we developed the cost estimate. SMIN Power Group installed the community energy storage on time and within budget. Long term, the system reduces energy costs by 17% for the community. Our solution is a one-time investment and has a payback of 8,2 years. After this time the community will have free electricity! Our solution provides clean, reliable, cost effective and quiet electricity for the customer. SMIN Power Group is helping the community fight climate change to preserve the Earth for future generations. SMIN Power Group designed and installed a system that will avoid 629 Metric Tons of greenhouse gas emissions over 25 years. According to the USA Environmental Protection Agency, this is equivalent to removing 132 cars off the road for a year. It is also equivalent to avoid the CO2 emissions from 70,802 gallons of gasoline.